John U. Bacon has worked the better part of two decades as a writer, a public speaker, a radio and TV commentator, and a college teacher. Bacon earned an honors degree in history (“pre-unemployment”) from the University of Michigan, and a Master’s in Education. He also was awarded a Knight-Wallace Journalism Fellowship in 2005-06, where he was the first recipient of the Benny Friedman Fellowship for Sports Journalism. He started his journalism career covering high school sports for The Ann Arbor News, then wrote a light-hearted lifestyle column before becoming the Sunday sports feature writer for The Detroit News in 1995. There he wrote long features about Jackie Robinson breaking the color barrier, bullfighting in Spain, and high school basketball on a Potawatomi reservation in Michigan’s Upper Peninsula, earning numerous state and national awards for his work. After Bacon covered the 1998 Nagano Olympics, he moved from the sports page to the front page, roaming the Great Lakes State finding fresh features, such as the creation of the Mackinac Bridge, as unlikely a story as it is inspiring, and the defining effect the famous “Anatomy of a Murder” epic has had on its birthplace. Bacon left the paper in 1999 to free-lance for some two dozen national publications. These have included feature stories on Formula One racing in Australia for The New York Times, on Japanese hockey for ESPN Magazine, and on Hemingway’s Michigan summer home for Time. He has authored or coauthored many books on sports and business, including A Legacy of Champions: The Story of the Men Who Built University of Michigan Football (1996), Blue Ice: The Story of Michigan Hockey (UM Press, 2001), Walgreens: America’s Corner Store (John Wiley & Sons, 2004), and Cirque du Soleil: The Spark (Doubleday, 2005), Three & Out (2012), and most recently, Enzone: The Rise, Fall, and Return of Michigan Football (2016). As a complement to his writing, Bacon has been delivering speeches to corporations, university and service groups since 1991. He speaks on the themes in his books, including developing leaders, generating creativity and instilling discipline and teamwork. He has spoken from Toledo to Taipei, and Vancouver to Sao Palo for such clients as Chrysler, Ford, Microsoft Brazil, the American Museum Association and the Memphis Grizzlies. Bacon has found time to pursue his passions for radio, coaching and teaching. After being asked to fill in for local legend Ted Heusel on WAAM-1600 AM in Ann Arbor from 2000 to 2001, Bacon launched his own show, “Off the Field,” on WTKA-1050 AM. It has run on Sunday mornings, from 10-12, since 2002, making it the longest running show on the station. In the fall of 2007, Michigan Public Radio asked him to deliver sports commentary every Friday morning for its 500,000 listeners statewide. The station is looking to expand Bacon’s work in the coming months. Bacon has also provided commentary on documentary films for Michigan Public Television (“Michigan Football Memories,” 2004), HBO Sports (“The Rivalry: Michigan vs. Ohio State,” 2007), and A&E Biography (“Bo Schembechler,” 2009). Since the fall of 2007, he has been creating stories and conducting interviews for Fox Sports Detroit and The Big Ten Network. On the side, Bacon became the head coach of his former high school hockey team, Ann Arbor Huron. As a player in the early 80s, he set the record for most games in a Huron uniform without scoring a goal, 86 (he’s not braggin’ – he’s just sayin’). As a coach, he took over the worst team in school history (0-23-3 in 1999-2000), and helped transform them into the best (17-4-5, #4 in the state, and #53 in the nation), in just three seasons. In 2007, he was inducted into the Huron High School Hall of Fame. Bacon is now an average hockey player, a mediocre Spanish speaker, and a poor piano player – but this has not stopped him from enjoying all three. 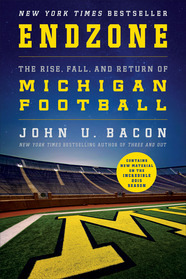 Bestselling author John U. Bacon's Endzone tells the story of how college football's most successful, richest and respected program almost lost all three in less than a decade - and entirely of its own doing. It is a story of hubris, greed, and betrayal - a tale more suited to Wall Street than the world's top public university. 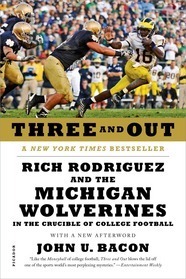 Three and Out tells the story of how college football's most influential coach, Rich Rodriguez, took over the nation's most successful program, only to produce three of the worst seasons in the University of Michigan's celebrated history. Leadership Lessons for Tough Times When times get tough, the tough get going--but the truly successful get going in the right directions. Best-selling author and internationally acclaimed speaker John U. Bacon gives you a funny, fast-moving speech filled with lasting lessons from his books on Cirque du Soleil (how to generate eye-popping innovations on a budget), Michigan Hall of Fame football coach Bo Schembechler (leading your way out of a losing streak) and Walgreens Drugstores (the importance of old-school discipline). He also draws on his own experience as a Hall of Fame high school hockey coach, who took over the worst team in school history (0-23-3) and turned them into the best in just three seasons--despite being the worst player in school history! Bacon will happily tailor his speech to your needs. Innovating the Cirque Du Soleil Way John U. Bacon got the amazing opportunity to spend six months as an “embedded journalist” with the most successful circus in the world, interviewing everyone from CEO Guy Laliberte to the riggers who keep the artists safe, and trying everything from the trapeze to the German Wheel. He wrote what he learned in Cirque du Soleil: The Spark--Igniting the Creative Fire that Lives within Us All, including how the people at Cirque du Soleil use budgets and deadlines, collaboration and conflict to inspire creativity - and still manage to make the shows start on time, twice a night, every night, around the globe. Lasting Leadership Lessons John U. Bacon shares the wit and wisdom of Michigan Hall of Fame football coach Bo Schembechler - the winningest coach of the nation's winningest program -- who coauthored the New York Times and Wall Street Journal business best seller, Bo's Lasting Lessons. In this fun, fast-paced speech, Bacon explains the specific principles Bo relied on to achieve his unqualified success -- the right way -- and how to apply them to your role as a leader. You'll hear Bo's distinctive voice through Bacon as he shares the principles that Bo applied on the field and in the locker room to create a football dynasty, and tells you how you can apply his insights to lead your life. You don't have to be a football fan to appreciate Bo's Lasting Lessons. His words will inform, invigorate and inspire--just as the man himself did every day. Check out an interview with John Bacon by The Michigan Daily. Learn more about John Bacon here and follow him on Twitter.